When the Bongo Flava star, Diamond Platnumz released the Iyena video with a wedding theme with Zari as the video vixen, the Wasafi camp felt this was the right time to persuade Zari to reunite with their boss. Diamond Platnumz manager, Babu Tale, was sent to South Africa on a mission to talk to Zari and convince her to come back to Diamond Platnumz life, but the mom of five stuck to her guns. Soon after his performance in UK, Diamond Platnumz rushed to South Africa to see if everything was all set, but no it was not. It was not a wasted visit because he caught up with the children he had missed since their black rose Valentine's day break up. On coming back to TZ, the singer made the news of the mansion he bought for Hamisa public after noticing that the way things were unfolding, he could easily lose out on both babes. Hamisa had also cut wires following the way she was being treated by her baby daddy's family members. The house has kind of put Hamisa in line for now. Trust Zari, it is either her or no one else, so the Hamisa house issue just made the gap between them become wider. 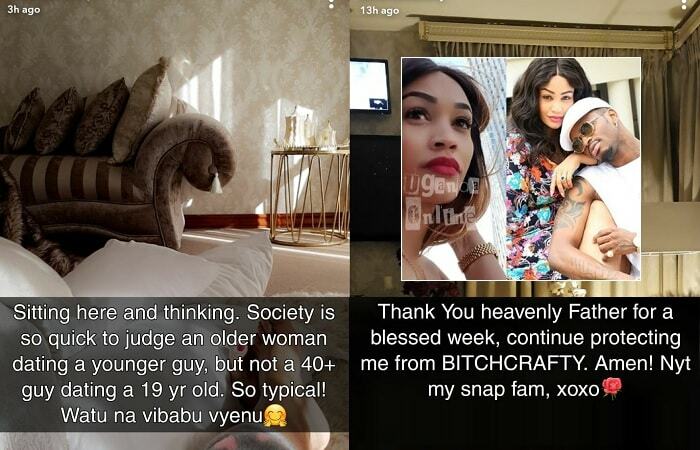 Using Snapchat Zari made it clear to their fans that they were not yet back together, but as she noted in her break-up note, they will be co-parenting.